This is the standard tubing material for chromatography, suitable for a wide variety of applications. Close tolerances are held on both ID and OD. Note that bulk tubing is roughly cut with tubing pliers, so the ends must be properly cut before use. For eletrolytically-cut premium SS tubing with burr-free ends, please order our steam-cleaned pre-cut SS tubing, which arrives ready for use in high end LC applications. Type 316 stainless in a variety of sizes for HPLC and GC applications, featuring a smooth internal surface, and a soft annealed OD for easy ferrule connection. The standard grade has a welded seam, while premium grade is seamless. Our pre-cut Type 316 SS tubing is cut to square, burr-free ends and specially steam cleaned. 1/16" pre-cut tubing is available in lengths most commonly required in HPLC systems. 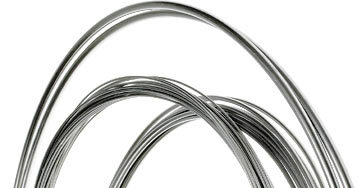 Flexible pre-cut tubing is made of 1/32" premium grade stainless with laser-welded 1/16" ends. Both types have a dot of colored ink to identify the ID. We recommend pre-cut stainless steel tubing for zero dead volume connections.